A sizable snow storm descended on Dodge Ridge last week, pushing the Tuolumne County ski resort a little closer toward opening. This past week, Dodge Ridge received 24 inches of new snowfall at the summit, 6 inches at the base, and over 12 inches at mid-mountain during the Thanksgiving week. The winter storms are lining up and Dodge Ridge is optimistic about making an opening day announcement soon. There’s more good news to come for skiing and snowboarding. The winter storms are lining up and Dodge Ridge is optimistic about making an opening day announcement soon. 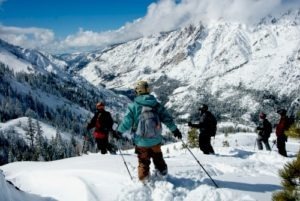 Get updates on conditions on the DodgeRidge.com Snow Report page or call the 2-hour Snowphone line at (209) 536-5300. The recent snowfall has been excellent for ground freezing and base=building conditions. The next round of snowfall is set to arrive midweek with a multi-day series of storms. In addition, forecasts are indicating the potential for continued snowfall for the first part of December. Dodge Ridge relies 100 percent on natural snow and traditionally opens each winter season in mid-December. Located in Tuolumne County in Pinecrest, CA off highway 108, Dodge Ridge has easy access from California’s Central Valley, Monterey, Sacramento and the greater Bay Area. Now available for only $68, skiers and snowboarders can purchase discount adult lift tickets to Dodge Ridge from participating Save Mart and Lucky’s Supermarkets throughout the Bay Area and Central Valley. These discount lift tickets are available for the whole family at one of the lowest prices in the Sierra. See all pricing and the full list of over 60 participating stores from the Deals Page at DodgeRidge.com. In preparation for the 2018-19 winter season, Dodge Ridge is actively hiring for a variety of positions, both indoors and outdoors. Winter jobs are full- and part-time positions, available with training provided, along with numerous perks like a season pass for employees and lift tickets for certain members of the employee’s family. Apply online at DodgeRidge.com/jobs. Tuolumne Country Transit will be offering their Dodge Ridge Ski Bus once again this season for only $10 round trip from Sonora to Dodge Ridge and all points between. The bus will be offered on weekends and holidays throughout the season and advanced reservations are recommended. To get more information, visit Tuolumne Country transit online at tuolumnecountytransit.com/skibus or call (209) 532-0404. The Dodge Ridge Administration Office and Sport Shop are open seven days a week from 8 am to 4:30 pm to help you make lesson reservations for the upcoming season.